St. Pierre Center for Massage, Inc. does not provide medical advice, education or treatment. The information contained in our brochures and websites are for general information purposes only and does not address individual circumstances or medical conditions. It may not be right for you and should not be relied upon in making decisions about your health. Always consult your doctor for medical advice. 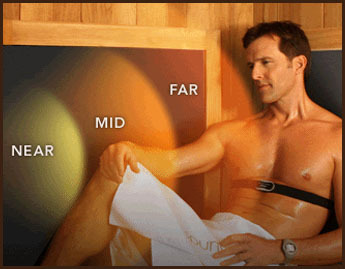 Our goal for our full spectrum infrared therapy treatments is to offer many health benefits. Come in today and visit our full spectrum Infrared private Sauna Suites at St. Pierre in Napa, California to bask in infrared sauna benefits. Surround your body with soothing full spectrum infrared therapy that penetrates the body at the cellular level leaving you feeling light and vitalized. Sunlighten's 3 in 1 infrared is the active ingredient that purifies the body, provides pain relief, boosts energy and shrinks belly fat. Using Sunlighten™ saunas featured in our spa allow you to detox seven to 10 times faster than a conventional sauna. In a conventional sauna, the average person will only sweat out 3 percent of toxins and 97 percent water. But in a Sunlight sauna, you'll sweat out 20 percent toxins and only 80 percent water. Full spectrum infrared sauna heat treatments are ideal for the relief of back, neck, and arthritis pain. Studies on heat responsive pain (HRP) have proven remarkable therapeutic benefits by using continuous low-level heat therapy for treating lower back and upper body pain, and all conditions that fall under the HRP classification. A full spectrum infrared sauna is a great way to lose weight. A 30-minute session can burn from 200 to 600 calories. As your body works to cool itself, there is a large increase in heart rate, cardiac output, and metabolic rate. Full spectrum infrared heat therapy raises your core body temperature, causing passive cardiovascular conditioning, and an increase in your circulation and sweat. A treatment in a full spectrum infrared sauna can improve your skin's appearance. Open wounds heal quicker with less scarring, and will help with acne, eczema, psoriasis, burns, and any skin lesion or cut. In addition, it reduces wrinkles, makes your skin look radiant, firms and improves skin tone, and elasticity. Regular use will help reduce cellulite underneath the skin, lessen the appearance of scars, and help burns heal.